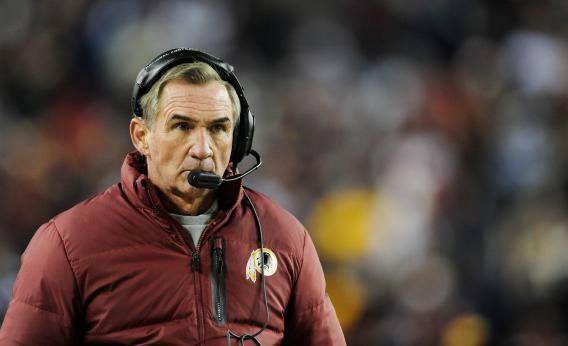 Mike Shanahan, RGIII knee injury: Why the Redskins coach shouldn't be attacked for playing Robert Griffin III. Why the Redskins coach shouldn’t be attacked for playing Robert Griffin III. But these scenarios are not the same. In one, we can say exactly why the coach was wrong. We can run the numbers to produce an estimate—not a perfect one, but a pretty good one—of Rivera’s wrong-headedness. We can express his failure as a change in betting odds. In the other, there is no way to know if Shanahan was wrong or right. We can wring our hands and call him names, but we have no math to fortify our hindsight. We have only the crude and shaky logic of what happened. Let’s start with issue one: Did Shanahan, like Rivera, screw his odds of winning this one specific game? That’s a fine topic for sports-talk radio, but not so good for rational analysis. The backup (who happens to remind his coach of Drew Brees) might have had a better game than Griffin, but he didn’t play so well when he did come in, and his success in prior weeks came against some lousy teams. If it weren’t for the injury, Shanahan’s decision to leave the backup on the bench would have been debated but not deplored. What about issue two, and the charge that Shanahan risked his star’s career? Was it foolish—or unethical—to leave Griffin in the game? This is where a lack of data can be distorted into pseudoscience. “I did put myself at more risk being out there,” the quarterback said on Sunday night. This statement went unchallenged in the media, even as we were told that players don’t understand what’s good for them. (Earlier in the day, when Griffin said he felt well enough to play, he was not to be trusted.) We know it’s dangerous to play football on a tender knee. That’s common sense. But common sense isn’t always so reliable. The treatment of a knee injury is tricky and subjective, David Brown reminds us in a thoughtful piece for the Washington Post. (“There’s no cookbook,” as orthopedist-to-the-superstars James Andrews likes to say.) One doctor explains to Brown that a college injury like Griffin’s doesn’t make a player more likely to bust his knee again. Neither does the sort of sprain that Griffin suffered in December predispose an athlete to a tear in his ACL. Griffin may have been ineffective, but he wasn’t necessarily fragile—in which case Shanahan’s only folly was to think his ailing star could win the game. When it comes to knee injuries, experts can’t agree even on some basic principles. After Derrick Rose tore a ligament last season, a University of Chicago surgeon who does scores of ACL reconstructions every year argued it was because the Bulls point guard had missed so many games with other injuries—“if he was a little bit stronger, his muscles would have fired and kept his knee still.” But David Altchek, one of the best-regarded sports doctors around, said that was hogwash. “There is no evidence that wear and tear, or that kind of issue, playing too much, really has any correlation with ACL injuries in any sport that we’ve ever studied,” Altchek told the AP. In the face of all this uncertainty, there certainly was a case for leaving Griffin in the game. He may have given the Redskins their best chance of winning, and if he did strain his ACL or suffer a low-grade tear he’d have a full offseason to recover. Of course there was the possibility of a worse outcome, too, that Griffin would hurt himself more severely and need another surgery. In thinking that one through, Shanahan could have drawn on some statistics: 63 percent of pro football players who undergo a primary ACL reconstruction return to play, an average of 10 months later. Higher draft picks like Griffin tend to have better odds than most. So Shanahan did what he thought was best for his team. (In this case, at least, a head coach and his player would seem to have the same incentives: They both want to win the game, and they both want Griffin to have a long and prosperous career.) He did what people with his job must do: He weighed the risks and benefits. When it comes to punting on fourth down, we can tell if a coach is playing smart or playing stupid. When it comes to on-field injury, the probabilities are harder to grasp. Is Shanahan to blame for what happened Sunday evening? Has he made a terrible mistake? There’s no way to know for sure. You’ll have to trust your gut.